Synthesized Source: The synthesized source has low phase noise and 1 Hz frequency resolution. VCOs are used for frequencies above 3 GHz and an integrated RF synthesizer for the 1 MHz to 3 GHz range. Optionally increased output power is available from 3 to 24 GHz. Internal filtering results in excellent harmonic performance of <-55 dBc for improved scalar measurement accuracy. Optional step attenuators are available to set low output powers for amplifier or receiver testing. In CW mode the source can be used for local oscillator substitution. A power sweep is provided for amplifier gain compression testing. External FM can be applied by connecting a generator to the rear panel. With the FM option, an internal generator provides frequency modulation of the source. When used with the scalar analyzer the source provides a swept synthesized output for frequency characterization of components and systems. Scalar Analyzer: The three input scalar analyzer provides network characterization of components and systems. Simultaneous measurement of insertion and return loss are displayed on the 6820 color screen. 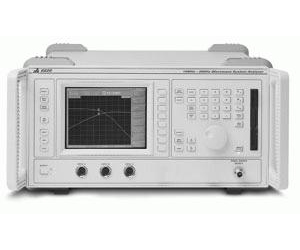 Excellent measurement accuracy is assured by the use of EEPROM corrected detectors.